Those cute fuzzy chicks have been growing like gang busters! 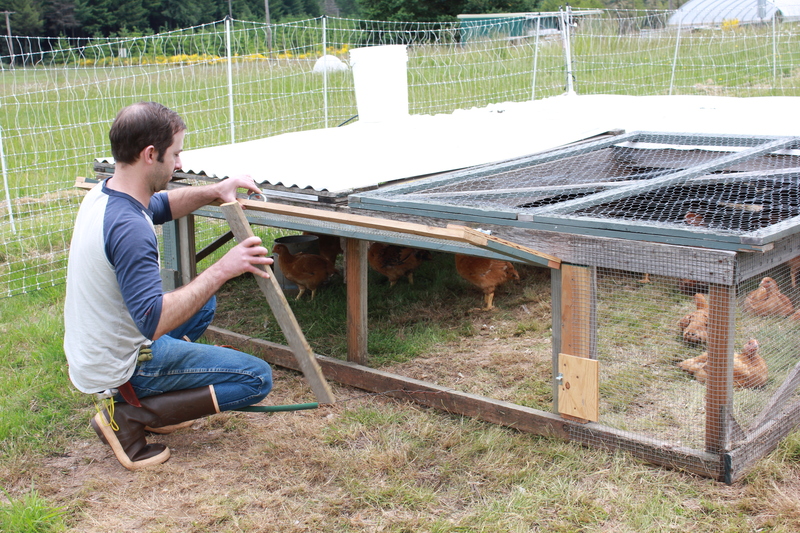 We lost just 3 during the brooder phase: totally my fault…. it kind of helps if you check the brooder lamps and be sure BOTH are plugged in the first night. Hey, it happens: some chicks fail to thrive, others just don’t cope with the stresses of environmental inconsistencies as well as the others. Expect to lose 10% of your chicks. At 3.5 weeks old, Freedom Rangers are nearly fully feathered and ready to get outside! That brooder gets smaller every day when you’re a fast growing baby chicken. 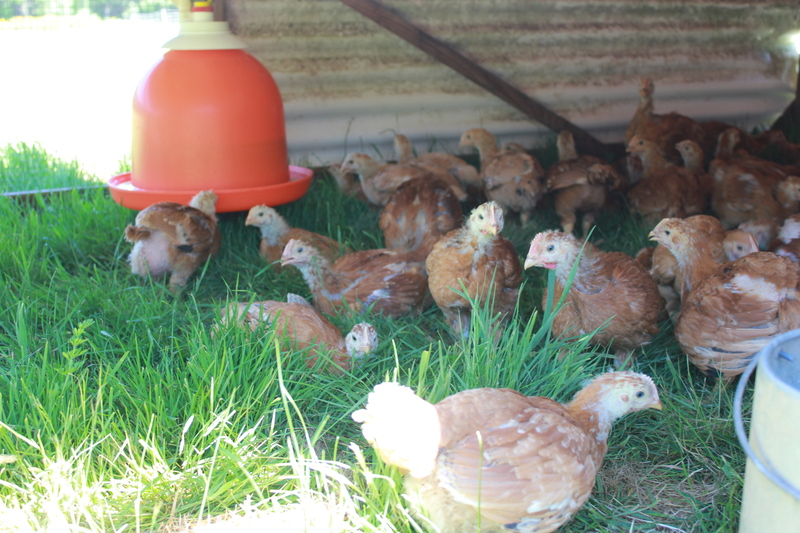 If you have a brooder area attached to a run you can begin letting them out as early as 2.5 weeks old as long as they still have access to their warm brooder lamps. 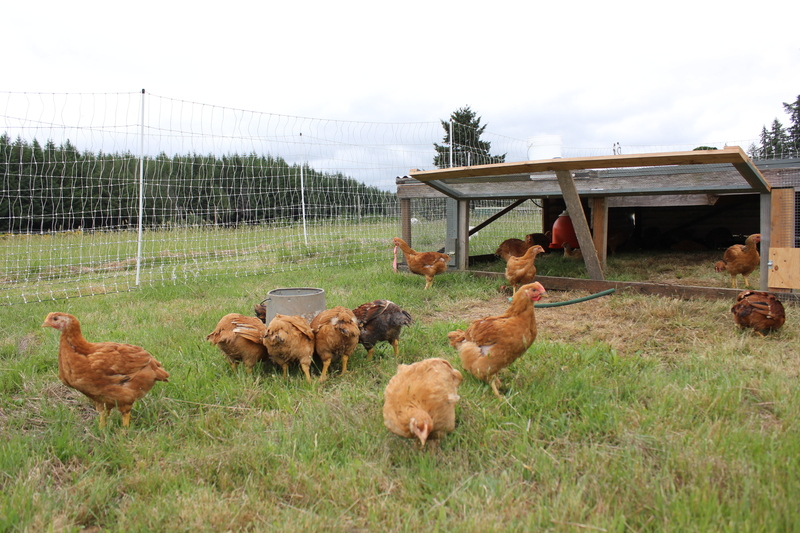 We move ours out to a pasture area enclosed with electric netting, so everyone gets moved at once. Moving day: We collect each chick by hand and transport it in a large carry cage. It takes us several trips. We try to avoid stressing them as much as possible, but this moving day results in a lot of panicked squacking – never fear, chicks: you’re about to be sooo happy! It’s ideal if moving day coincides with a spell of nice weather. Moving from a warm, dry brooder into a drafty, damp tractor surrounded by rain is not the way to ensure healthy chicks. But if the forecast is not working with your plans you may wish to add a tarp to reduce drafts and even consider adding one heat lamp to a corner. If the weather looks dry, they should be just fine without the additional heat. 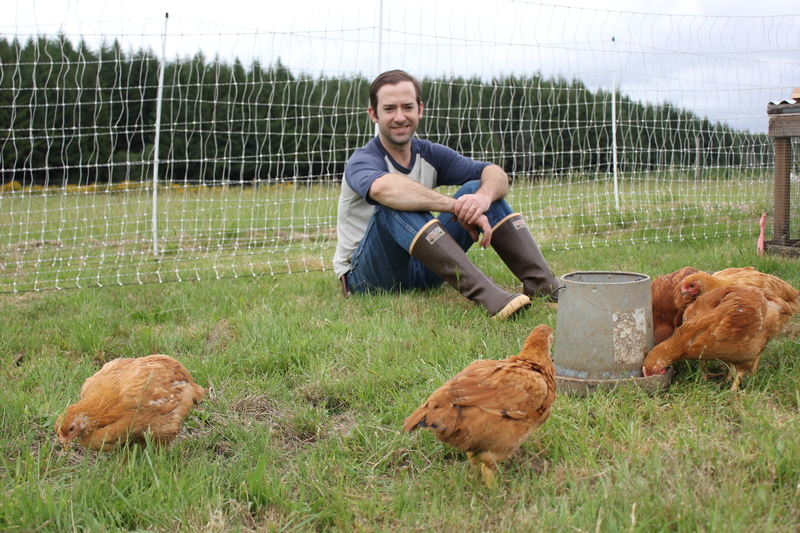 Thoughts on using a tractor vs free ranging: We free range our birds within a safe boundary of electric poultry netting. But for their first 1-2 weeks on pasture we keep them confined in a tractor. Ours is a Salatin style tractor that we’ve rigged up with some improvements. We still mostly hate it and will be building something better and easier to roll (like our super awesome duck coop) one of these seasons. 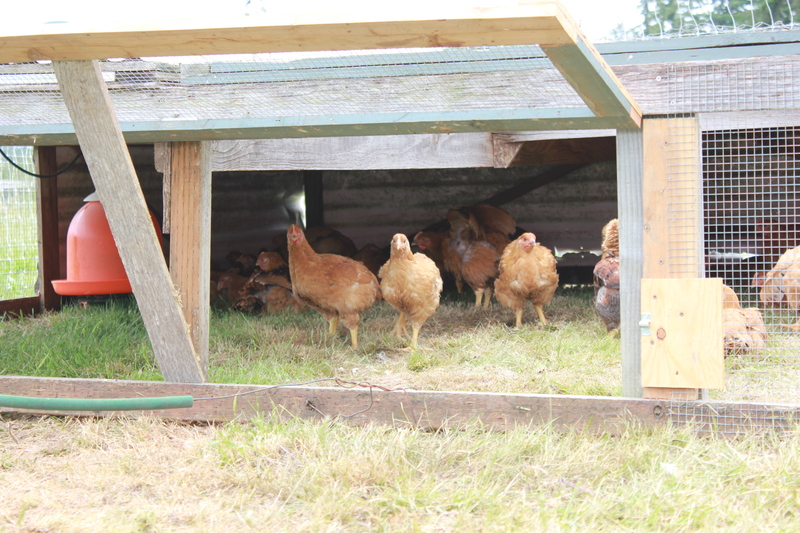 Tractor Pros: large area for shade for the chicks, plenty of room for the chicks to loaf around, we added a roost for them to perch and plan on, easy to hang bell waterers from. Tractor Cons: really freakin heavy and hard to move, even with the tires we added that don’t really work well; hard to access the chicks on harvest day because it’s low to the ground, did i mention it’s really heavy? The reason we confine them to the tractor for the first few weeks is two fold: at this age they’re still easy pickings for ravens, which are a problem on our farm. Confining them for at least a few days ‘homes’ them to the safe area and location of water. Free ranging: The reasons we let them out of the tractor after the first few weeks are many fold: They get more exercise, they spread their manure out more evenly, they get to live lives as foraging chickens vs sitting around all day chickens (though to be honest, they still sit around most of the day in the shade), we don’t have to move the (really freakin heavy) tractor daily. Once the tractor is open and they have access to their full run, it’s such fun to look outside and see the Rangers running about, catching bugs and chasing off starlings. They are a bit nervous about ‘the outside world’ that first time we open the hatch, but soon they move freely in and out. Giving them the full space to run means we no longer have to move the tractor daily, but still move it every few days (the manure builds up fast) and as the tractor reaches the far side of the netting we set it up with fresh pasture ahead. So far we’re loving this system. The hatch door we added to the tractor works well and is held open with a simple prop of board. They do still spend most of the day inside in the shade but spend most of the early morning and late evening out and about. We close them up at night to double protect against predation that might get over the fence. We haven’t lost a single bird since they went out to pasture, despite trying our best to crush one with a support beam inside the tractor the first time we moved it. Yay! These 6 week old Rangers are growing fast! 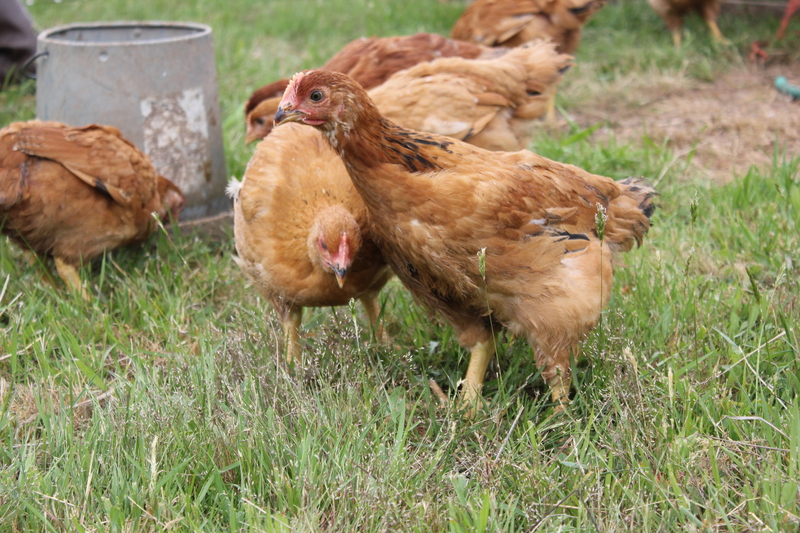 We offer feed free choice, refilling their bucket twice a day plus more feed spread in a line in the grass. They forage well along with eating the pellets, taking advantage of grass seed heads as well as any bugs they might find. In 2017 we grew our birds to 12.5 weeks. As they approached the 12 week mark that feed intake went up a lot. We harvested some birds as large as 8.75 pounds! This year we plan to harvest at 9.5 and 10.5 or 11.5 weeks.